Siyasanga Papu is a South African actress best known for her role as Nomathemba on the supernatural drama series The Herd. She has acted in numerous other television series including the SABC1 drama series Usindiso and soapie Generations: The Legacy; the SABC2 medical drama Hillside (playing two different characters in each season); the e.tv soapie Rhythm City and the second season of the Mzansi Magic drama series Saints and Sinners. 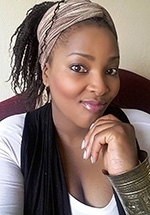 Siyasanga also played the recurring role of Fezeka on the sixth season of the Mzansi Magic soapie Isibaya, first appearing in Season 6, Episode 191 (which aired on 3 December, 2018). In 2018 the landed her largest role to date, as Nomathemba on the Mzansi Magic supernatural drama series The Herd. Recurring in Season 1, she was promoted to starring cast for Season 2, in 2019.